Hannibal seems to have recovered some of his joie de vivre. Before this episode, when is the last time he smiled or joked? 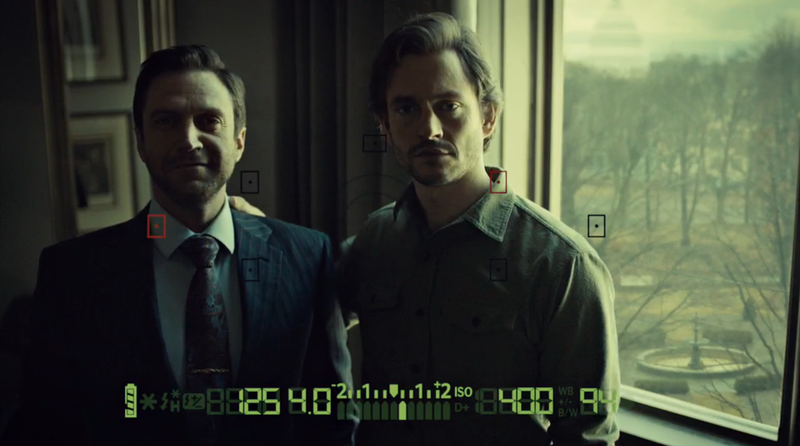 But everything is going his way now — now that Dr. Chilton has finally gotten what’s coming to him, and now that Will and Francis have finally gone through their becoming. It sure seems like they are. 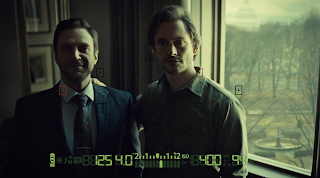 In trying to catch the Red Dragon, they are repeating their past attempts to catch Hannibal almost exactly: by using Freddie to plant a story and using Will as bait. This episode even includes a “Fred” in a flaming wheelchair yet again. Only this time, Will and Jack know exactly what they are getting themselves into. They just don’t care. Will and Jack know they are putting Frederick in a vulnerable position. Jack sees himself as a god setting up his sacrifices for a greater good. Will asks Frederick to be in the picture and, on some level, knew he was dooming Frederick when he put his arm around him. “You put your hand on me in the picture like a pet,” Frederick says. And everyone knows the Red Dragon kills pets first. Bedelia has it right when tells Will “you may as well have struck the match. That’s participation.” (A repeat of one of Hannibal's phrases.) The most anyone in this world can really hope for is that what they want overlaps somewhat with what Hannibal wants. Will and Jack decide to participate in this plan if it helps them also catch the Red Dragon. They decide it’s worth sacrificing Frederick as a pawn. I have always liked Frederick. His smarm has always been a little charming and a lot funny in a world that needs some levity. Even when he was fearing for his life, his sycophancy was on full display. Raúl Esparza and Richard Armitage were both incredible in their scene together. Frederick’s ugly crying was Emmy-worthy and Francis was legitimately scary. It was even scarier when Francis was shot from below because he seemed so big and looming, and the audience shared Frederick's view, placing us in the same vulnerable position. When Reba stopped by, I yelled at the screen, afraid for what she would find walking into the dragon’s lair. But she was unharmed this time and left Frederick and Francis alone again. Frederick is not exactly stupid, but it’s not exactly smart either to think you can play by your own rules in Hannibal’s game. He was marked for death the second Hannibal deemed him rude. Hannibal gave Frederick fame and fortune, but he also took away half of his face. Maybe Frederick thought they were even and he could keep using Hannibal without deadly consequences. But as Will says, if you play, you pay. Everyone Hannibal has touched is marked for doom in some way or another. Bedelia knows she is marked, but she also knows that Hannibal wants to kill her himself, and only if he can eat her. So she feels she is safe for now, but she knows she isn’t safe forever. Will has been marked. He may have thought he was free, but he only had three years to live in the world and find a family because Hannibal was confident that he would take Will’s family away when the time came. And he did just that after he sent the Red Dragon after them and made Will turn to manipulation again to keep them safe. Will is finally becoming what Hannibal wanted him to become from the very beginning: a killer, just like him. Bedelia even notes that Will was curious at what would happen if he led the Red Dragon to Frederick — a reason Hannibal has used for some of his greatest manipulations. Francis has also gone through his becoming, and he is now fully the Red Dragon, complete with wings. Francis is a fantastic villain. I believe in his loving scenes with Reba just as much as his terrifying scenes with Frederick. Only now, that Francis is gone and only the Red Dragon remains, his scenes with Reba are terrifying, too. With Hannibal's help, he has finally become a masterpiece. But is he William Blake's masterpiece, or Hannibal's? After all, it’s all Hannibal’s design. Next week is the season — and likely series — finale. This episode turned things up to 11 as we hurtle toward the conclusion. It has been an absolute pleasure to talk about Hannibal each week with you all, and I am both looking forward to and dreading the end. Hannibal was hilarious after finding out Frederick’s fate. He hasn’t been so giddy, well, maybe ever. And to whoever makes that GIF of Hannibal eating Frederick’s lip... I do not want to see it. Francis’ robe and reveal reminded me of Buffalo Bill in the Silence of the Lambs. Coolest scenes: Jack and Hannibal’s reflections merging into each other; the red dot of the focus point of the camera marking Frederick; the flaming wheelchair; any time that Francis literally became a dragon. What was the scariest part for you guys? Mine was definitely Francis biting Frederick's lips off. Gross! I had to look at the screen through my fingers.